CitriSurf 2250 is a high quality blend of chemicals formulated for the cleaning and passivation of stainless steel products. CitriSurf 2250 is specifically designed to provide low cost and efficient removal of contaminants and all free iron from the surface of most grades of stainless steel, including austenitic, ferritic, martensitic, precipitation hardening, and duplex, providing the highest chrome oxide levels possible. 5 gallon or 55 gallon plastic containers. Larger sizes available upon request. CitriSurf is an excellent cleaner by itself for many cleaning and passivation processes. However, to assure best results and help extend the life of the bath, the parts to be passivated may be cleaned with an appropriate cleaning solution prior to treatment with CitriSurf solution, especially when heavy grease and oils are present. For grades containing high carbon, sulfur, or selenium, preclean using a good water based alkaline cleaner of pH ≥10 (see KleerKleen 4002). CitriSurf 2250 is an emulsifying cleaner. All equipment, mixers, tanks and pumps should be clean and dry prior to mixing of CitriSurf solution. CitriSurf 2250 should be mixed with clean water (purified water if desired) at a ratio of 1 part of CitriSurf 2250 with 5 to 10 parts of water by volume to fill the tank used so as to adequately cover all parts to be treated. Polypropylene, stainless steel, or equivalents should be used for construction of all tanks and devices used in the CitriSurf bath. Agitation of the solution in the tank is strongly recommended to attain optimum results. Air bubble agitation may produce excessive foaming (see CitriSurf 3250). Optimum results can be obtained with many parts by using CitriSurf in an ultrasonic tank. Heat the solution for optimum performance. 120-160°F is typical. Room temperature is often adequate with increased immersion time. Teflon coated (or equivalent), stainless steel or titanium heating devices are recommended. Completely immerse the parts to be passivated in the solution for a period sufficient to remove all free iron and contaminants from the surface. This is typically 5-20 minutes, depending on temperature, grade of stainless steel, hardness, use of ultrasonics, and the condition of the surface of the parts. Your tests should indicate the best combination of bath parameters for the products you manufacture. Rinse the parts thoroughly with clean water. Flowing water is optimum. Purified water may be used to prevent water spotting. Dry completely in air immediately. Drying can be accelerated by use of a hot air oven or other drying medium to attain a highly passive surface. Although very safe in normal use, CitriSurf 2250 is a Citric Acid based material, and as such it may cause irritation to exposed surfaces of the body. See Safety Data Sheet before using this material. For large items, on-site, or spot treatment applications, ready to use versions CitriSurf 77 and CitriSurf 2210 are available. Extremely sensitive grades of stainless such as 420 may require the use of CitriSurf 2450 instead. Replenish the bath with CitriSurf and water as appropriate to compensate for dragout, evaporation, and acid consumption. The Specific gravity of the CitriSurf 2250 bath should be held within -0.001 of its initial value for normal operation. See Maintenance Sheet for further information. 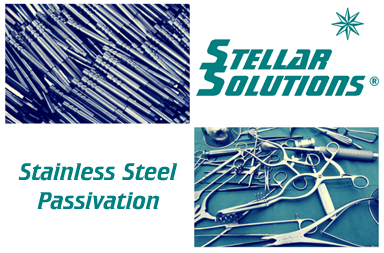 For technical assistance, please contact Stellar Solutions at (847) 854-2800. When used correctly, CitriSurf 2250 meets the requirements of the ASTM A967, ASTM A380, ASTM B600, and AMS 2700 standards. Testing of your products with CitriSurf before using in production is recommended. Every product and production facility is different, and requires testing to ensure that CitriSurf is compatible with the particular situation. No warranty is implied, or may be given in writing or verbally without the written permission of Stellar Solutions, Inc.
We are here to help! Request advice on your specific application or a quote on our products by filling in the form below. We typically reply within one business day (often much quicker). You can also call us at (847) 854-2800. Thank you!